America seems to be undergoing a trend of big corporate machines replacing family-owned, private businesses. This is a problem that affects not only people around the nation but also our students right here on campus. Starbucks, one of the biggest coffee-producing companies in the country, is replacing Nicoletti’s Café at the University Center. This community should not allow these moneymaking machines, like Starbucks, to take over the heart of our campus. To fix this problem, students should make an effort to take advantage of the Isla Vista eateries exclusive to our college and local community. The small businesses in Isla Vista and on our campus, such as Nicoletti’s, Silvergreens and Cajé, add to the culture of this university. The unique drinks at Nicoletti’s that students have loved for many years will now be unavailable and have been usurped by typical drinks students can get at any block outside of campus. Replacing our unique small businesses with a mainstream, popular one does not do justice our community values. Because many people are more interested in the popular reputation of Starbucks, the UCen Governance Board is hoping to gain more revenue in its implementation. However, no longer will students be able to grab a unique ice-blended Turtle on their way to class, but they will now have to choose between the Vanilla or Caramel Lattes, which are already offered at the Arbor and other places around campus. Replacing a local coffee shop that students have frequented for years is not the way to solve financial problems within our campus. With the loss of these unique parts of our campus and community, the culture of the University of California, Santa Barbara will start to become homogenized. The large corporations invading campus will create a different atmosphere. Students will no longer feel as comfortable taking a break at the UCen between classes due to this change. It’s time for the students at UCSB to take action and not allow our capitalistic, money-driven society take away the parts of our school that make our campus unique. Sam’s to Go is a local sandwich eatery that has served Santa Barbara students and residents for many years. But with Ike’s recently entering Isla Vista, Sam’s to Go is losing many of its local residents who they rely on to stay in business. 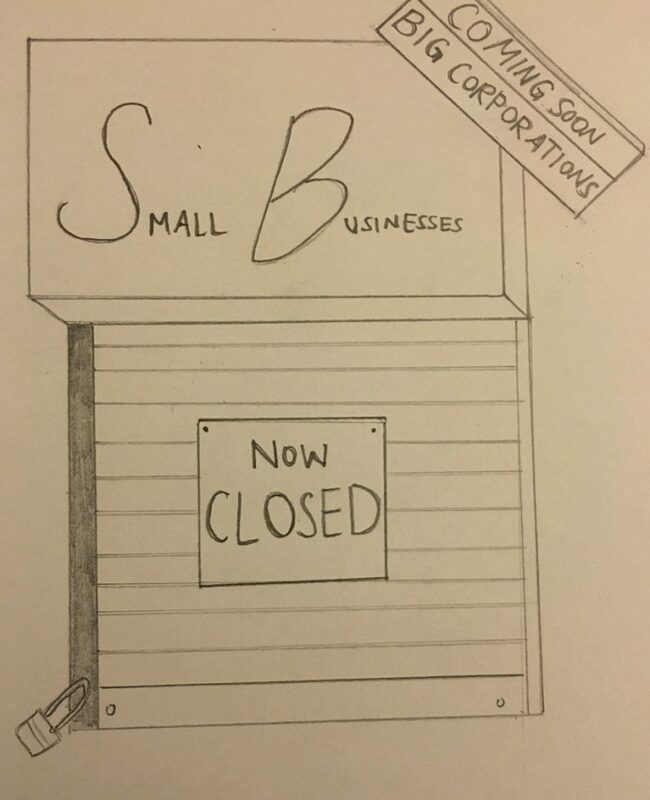 We can solve this problem by showing our support for local businesses, an easy and necessary step all UCSB students can take. Support the eateries that make Isla Vista the community it is today such as Cajé, Silvergreens and Nicoletti’s. These places, exclusive to the Isla Vista and Santa Barbara community, have set the tone of the city for many years. Changing the places that students have relied on for years changes students’ day-to-day life and eventually changes the community as a whole. Supporting small businesses benefits the community, the economy and the students. Local Isla Vista businesses bring students together and allow them to connect on a level no big corporation can match. They show more willingness to support the community by hiring UCSB students and catering to individuals’ needs. For example, Nicoletti’s consists of a full staff of students, while Starbucks consists of a mixed group of people. When going to a big coffee corporation like Starbucks or Peet’s Coffee and Tea, most people will pick up a drink and leave. At Cajé, students meet up with others and interact with the staff, helping to create a connected community. It is a shame that to remedy the debts of the University Center, we choose big names and generic products over community values. Rather than submitting to these drastic precautions that change the school, student life, economy and atmosphere, students need to stop this disturbing trend by supporting local businesses.